If 111 varieties of cheese on one single pizza just isn’t enough, along comes Melbourne’s Johnny Di Francesco from 400 Gradi with his world record-breaking 154-cheese carb star. No pizza in the world has ever been cheesier than the epic 154-cheese pizza, made by Johnny Di Francesco from 400 Gradi in Melbourne. The creation, recognised by the Guinness World Records as having the greatest variety of cheese on a pizza anywhere on the planet, wowed diners when it made a brief appearance on 400 Gradi menus across six Australian restaurant locations late last year. The "cheesy pizza" sold out at all venues within five days, with a total of 797 pizzas ordered and eaten by customers. Now, that same record-breaking cheesy pizza has made a return. The only catch is that it’s available at one location, 400 Gradi in Essendon, and you have to give the restaurant’s pizza chefs due notice to create it. The 154-cheese pizza – which comes in a medium size, sliced into four for $28 – still holds the world record for the cheesiest pizza in the world. It features cheeses from all over the world, of varying textures and tastes, on the pizza’s top and within its base. Di Francesco won the Guinness World Record after attempting to smash the previous record of 111 cheeses on a single pizza in September last year. The old record holder, the 111-cheese pizza, consisted of a total of 288.6 grams of cheese, using just 2.6 grams of each variety. It was baked by an American pizza chef at an event organised by pizza order and delivery service pizza.de, at a Berlin-based Italian restaurant. How do you make a 154-cheese pizza? As the Australian-Italian chef, Di Francesco, tells Guinness World Records, the first step to create the 154-cheese pizza is to select one gram of each kind of cheese from an international list, including Gorgonzola, pecorino, Taleggio, aged cheddar and Gouda. "We also needed to be sure each individual cheese was distinct enough from the next, yet complimentary to each flavour, and could blend really well together once combined," Di Francesco says in a Guinness World Records article online. Next, the chef melts down all of the cheeses together and chills them into a single, big 154-cheese block. The rest is a cheesy chef secret. "We also needed to be sure each individual cheese was distinct enough from the next, yet complimentary to each flavour, and could blend really well together once combined." Di Francesco is no stranger to a cheese-pizza challenge, having created a 99-cheese pizza in 2014 before he later attempted a 154-cheese variety. He says the pizza was inspired by a moment in the film, Teenage Mutant Ninja Turtles (also released in 2014), when Donatello refers to a pizza topped with 99 different kinds of cheese as a "culinary impossibility". The pizza became so popular, it became a fixture of the restaurant’s menu. “We had an overwhelming response from our customers, so much so that they petitioned to have it a permanent menu item," Francesco tells Guinness World Records. "Since then we decided to up the ante and create a 154-cheese pizza. So my apologies Donatello, the culinary impossibility was debunked." ‘Greatest variety of cheese on a pizza’ is only one of the many pizza-related record-titles up for grabs through Guinness World Records. Other highlights available from the global record-setting organisation include the world’s largest gluten-free pizza, most pizzas made in one hour, highest pizza toss, longest pizza and largest pizza delivery. Talk about a strong pizza game and in the meantime, we're just going to dive in for a piece of Di Francesco's pizza Margherita recipe right here, right now. Is this Australia's best pizza? Mario Franchina puts curry powder and pineapple on pizzas – and locals love it. Even Italians order the Hawaiian topping. Twenty years on, Mario's Pizza is an institution. Cheesy, gluten-free, and way bigger than your average pizza. Whether you fill it or eat it just as it is, a square of this crisp, golden, chewy bread is good any time of day. Italian nonnas had the right idea: a fast, easy pizza to fill hungry bellies. Potato bake meets everything you love about pizza in this Italian family's "gotta be on the table" side. It's like the perfect meatball pizza - juicy meatballs, just the right amount of sauce, drippy cheese, chewy-crisp dough - but a pie. Turn take-out night into a pizza-making party with SBS Food's pizza collection, with recipes from Italy and abroad. Sauce up and savour the crusts! 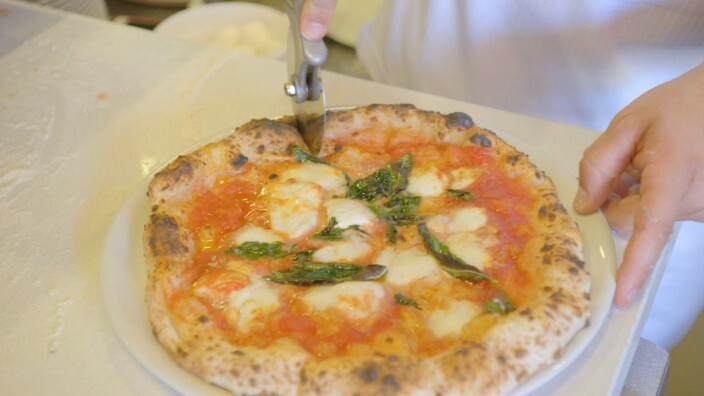 Naples' pizza-making is now part of the Intangible Cultural Heritage of Humanity UNESCO list. If you want to do as the Romans do, slice a slab open and fill it with mortadella.